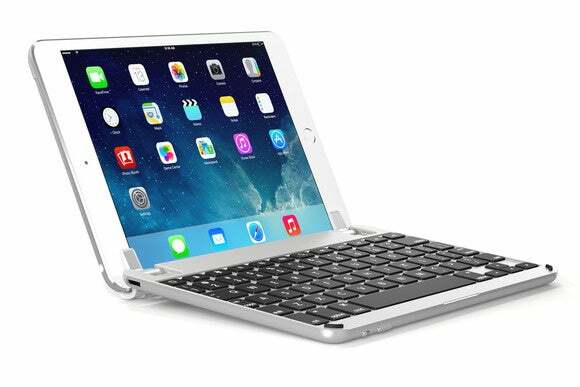 Looking for a premium keyboard for an iPad mini? Start your search with the BrydgeMini. While Apple was busy touting the benefits of increasing the iPad’s overall size, iPad keyboard maker Brydge has been hard at work creating a keyboard for the iPad mini. 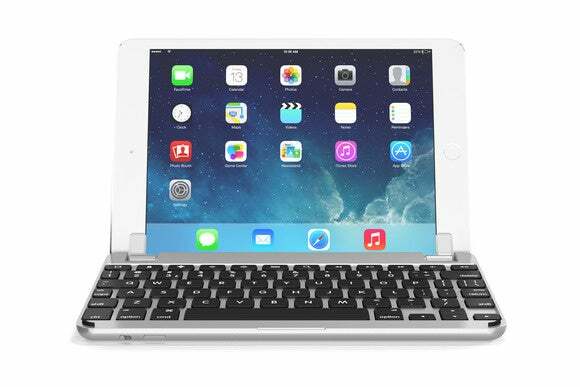 The BrydgeMini follows the same overall design of the BrydgeAir, the company’s keyboard for the standard iPad. Lacking from the smaller version, however, is the built-in speaker which I found to be a distraction anyways. The $129 BrydgeMini is available in three different colors: gold, silver, and space grey. The keyboard is compatible with every version of the iPad mini except for the iPad mini 4. The BrydgeMini features two hinges that hold the iPad mini in place. You simply slide the iPad into the silicone shims, pair the two devices in your iPad’s Bluetooth menu, and you’re ready to begin using the keyboard. The hinges rest on either side of the screen, and do a good job at holding onto the iPad mini. I was able to pick up the iPad mini by the keyboard, leaving the tablet ever-so-dangerously dangling above the floor and it didn’t slip out. I merely wanted to test their grip, and wouldn’t advise you to do the same. Perhaps my favorite feature of the entire Brydge line is its allowance for multiple viewing angles. In fact, there’s no limit to viewing angles. If you want to type on your lap with the back of the iPad mini resting parallel to the keyboard (flat on your legs) the BrydgeMini will let that happen. For those looking for specifics, the BrydgeMini has a 180-degree hinge. When closed, the BrydgeMini doubles as a protective cover for your iPad mini’s screen. Having a keyboard that’s not locked into only a few viewing angles goes a long way towards enabling you to be productive, regardless of your work environment. 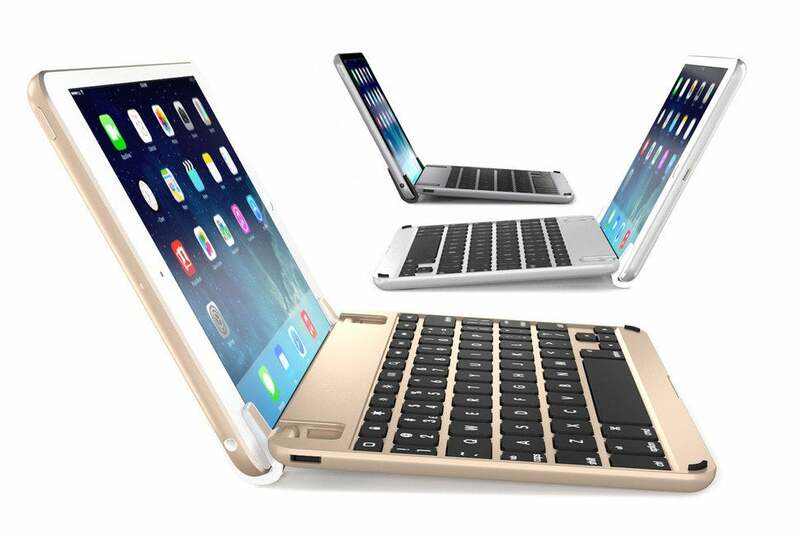 The BrydgeMini suffers from the same limiting form factor as any other iPad mini keyboard. Keys are cramped, a bit smaller, and often times moved around in an attempt to make the best of the small footprint. Taking that into consideration, Brydge has done a good job at maximizing space. The main letters are sufficient in size, as are the number keys. The downside is nearly all of the perimeter keys, such as punctuation and the shift keys are small and easy to miss as a result. The keys themselves are responsive and offer a fair amount of travel. With any new keyboard of this size, there’s a learning curve in both key layout and size. After a few days of typing, you should have no problem adjusting. The top row of keys are iOS shortcuts. You can expect to find keys to take you home, lock the device, adjust the keyboard’s backlight, screen brightness, search, and media playback controls. The backlight key improves upon a gripe I had with the BrydgeAir. On the bigger keyboard, pressing the backlight key simply turned the backlight on or off–it didn’t allow users to adjust the brightness. That’s now changed on the BridgeMini, which features three different levels of brightness. The battery in the BrydgeMini is said to last three months, and while I haven’t had enough time to determine it’s accuracy, I can vouch for the BrydgeAir having met or exceeded its battery estimates. It’s been awhile since I’ve tested a keyboard for the iPad mini. My recollection of the early days is full of keyboard that were overly cramped, providing for a horrible experience. The BrydgeMini is cramped, but does a good job at hiding that fact. I was able to pair it to my test device and begin typing, relatively error free almost instantly. Its $129 price tag is more expensive than offerings from the likes of Kensington or Logitech, but it’s aluminum housing is partly to blame for that (whereas other keyboards are typically housed in plastic). Someone looking for a premium keyboard for an iPad mini, the BrydgeMini is where your search should begin.